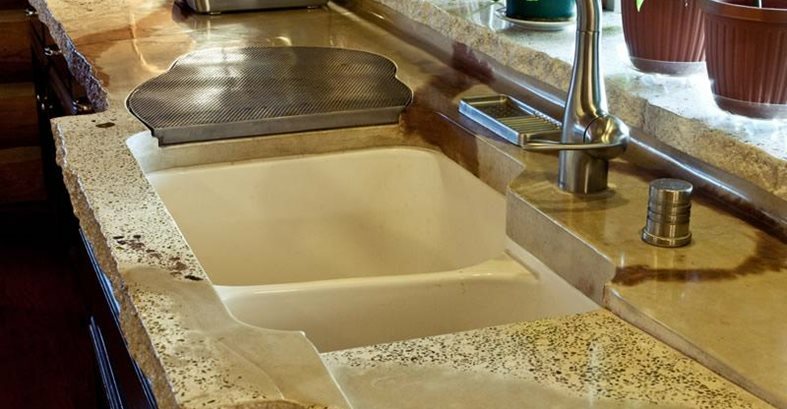 Swirls of rustic colors, earthy aggregates, and a roughened edge make this countertop the perfect partner for a hewn-log backsplash Project submitted by Jeff Klus, Klus Konstruction, Grass Valley, Calif. This precast concrete countertop appears to be carved out of wood, capturing the essence of the home's log walls and surrounding hillside setting. Six different integral color blends were used, along with pieces of hand-placed glass aggregate. Custom features include a free-form stainless steel cutting grate, a recessed drainboard, and a rustic roughened edge created with rubber molds cast against rough-edged masonry block. A concrete backsplash with the same colorization as the countertop was also used above the oven/range to tie together the look of both sides of the kitchen. Recessed into the concrete is a design depicting blades of grass along with polished stone inlays, to accent the rustic nature of the log post. 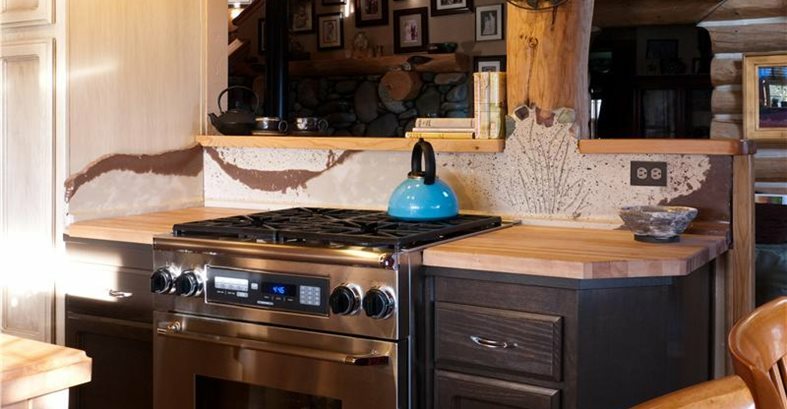 Proving that different materials can bring out the best in each other, this concrete countertop was custom made as part of a kitchen restoration project to enhance the organic, earthy feel of this log cabin home located in the Sierra foothills. It features swirls of warm color tones and a roughened edge that perfectly complement a hewn-log backsplash. However, templating and forming the 22-foot-long slab, which was shop cast in three pieces, was anything but a walk in the woods. 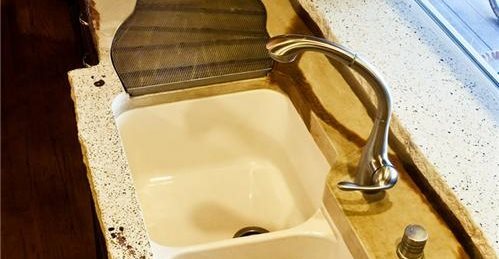 "It was kind of tricky," to say the least, says Jeff Klus of Klus Konstruction, a general contractor specializing in kitchen and bathroom remodeling as well as custom concrete countertops. "There were approximately six different custom color mixes for this piece. Some were a single color, some were a mixture of several. But the biggest challenge by far was how to create a counter and make it appear to have grown out of the logs at the backsplash area. I didn't take into consideration that normal countertop templating would not work in order to achieve the proper fit. It was kind of like trying to fit a square peg into a round hole, in that the logs are round and hewed, making for a different surface at any given point along the log face." The clients were looking for a kitchen makeover that would not only complement the beauty of their log home and the surrounding countryside, but would also shine functionally for people who love to cook and entertain. For the countertops, they wanted a material that would express their creative personalities while standing up to constant culinary abuse. "I urged them to go with concrete because I felt it was truly the only material that would satisfy the earthy nature of log cabin construction," says Klus. "They were hesitant at first due to concerns about concrete's possible high maintenance, but once I convinced them of the quality seal I use, they came on board." The design was a collaborative effort between Klus and the homeowners. The color scheme was arrived at by having the clients choose hues they liked from a color chart for Benjamin Moore Paint. By creating a separate ledge with a thinner profile thickness above the countertop, Klus was able to keep the backside at a complete 90 degrees without trying to template it to fit exact. "Regardless of any spaces or voids that were left between the curb and the log face, or the fact the walls were out of square, I was able to template the thinner ledge to make a very tight fit," Klus explains. I also created a recess with a lip under the ledge to give the appearance of being integral as a single pour piece along with the curb." All form materials for both the counter and ledge were Melamine, with thin plastic glued to the bottom to ensure a smooth surface. The form for the sink was a custom-made Styrofoam knockout, and all the counter recesses were created with rubber molds. To form the countertop's roughened edge, Klus used a liquid molding rubber to make a "copy" of a rough-edged masonry block. Reinforcement for the countertop is 3/8-inch rebar at the perimeter and 6-inch wire mesh and glass fibers throughout. To create the beautiful swirls of color and glass aggregate, Klus sprayed glue on the forms and hand placed the glass pieces in the desired design. He then ground and polished the surface to reveal the aggregate. "The color swirls were achieved by a combination of how I mixed the concrete and where certain colors were dedicated to within the form, with input from my client," says Klus. "I was trying, at the very least, to make this countertop a reality for these clients," says Klus. "Needless to say, I did a lot of head scratching to come up with something that would work." The clients love the results. "Jeff and his team worked with us to complement the natural beauty of the log walls by creating countertops with an organic feel - somehow capturing the essence of the surrounding hillside strata in our counters," they say.